Seoul is about to renovate the two streets leading to its main royal gates: Sejong-daero (Gwanghwamun, Gyeongbokgung's gate) and Donhwamun-ro (Donhwamun, Changdeokgung's gate). Needless to say, these are key locations, and authorities have to make sure that they do it right, and that to start with, there is a consistent and sustainable vision for Seoul's future. If the plaza is extended westwards: 6 lanes of traffic will disappear, and I'm perfectly okay with that, but only if all impacts are taken into account, and I'm not sure that's the case. To be consistent, Seoul authorities must have a clear strategy to reduce car traffic downtown - like most major cities. Unfortunately, several projects (e.g. from Jahamun to the Yulgok Tunnel) seem bound to generate more bottlenecks in a near future. If a new plaza is built to the west instead of the central one: we are back to square(!) one and a huge highway in the middle of the city - 12 lanes of traffic! 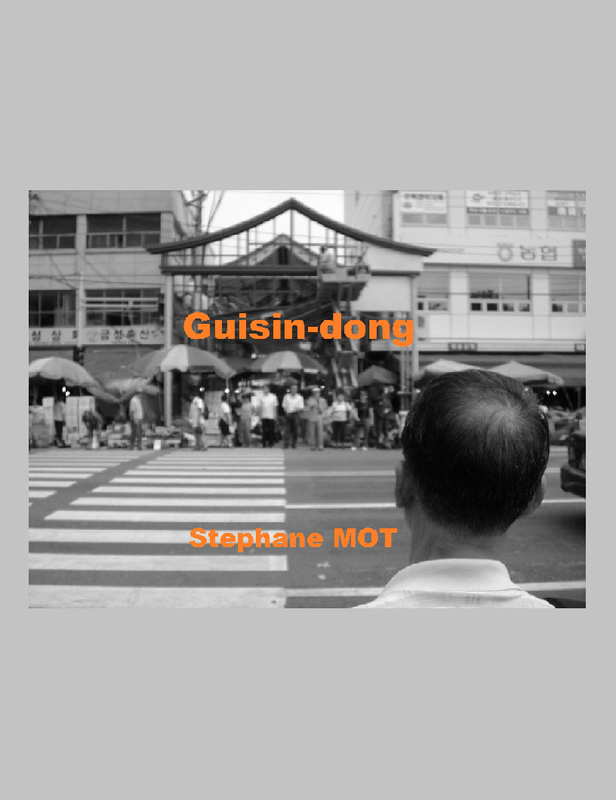 It would destroy not only Seoul's most valuable perspective (Sejongdaero-Gwanghwamun-Gyeongbokgung-Bugaksan-Bukhansan), but also Seoul's most vital pedestrian connector downtown (see links at the end of this post). (addendum 20141025) Rendering of the project where the Gwanghwamun Plaza is moved westwards, recreating the central highway that used to ruin downtown Seoul (source "광화문광장, 세종문화회관 쪽으로 이전 추진" (Hankyoreh 20140930). A total urban disaster, but maybe the actual aim of the game is to prevent demonstrations, the only case where it would make sense (much easier to close the area with much fewer troops). 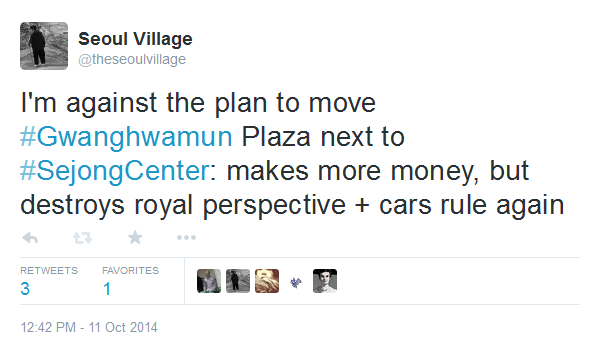 In the case of Donhwamun-ro, the idea is to boost tourism in a major but under-exploited historic neighborhood. A couple of years ago, I applauded the planned destruction of the two gas stations that faced the gate, but also shared concerns about the impacts of the Yulgok Tunnel on area. In this case, I'm at the same time glad that, at long last, the Changdeokgung-Jongmyo axis is considered as a key asset, and very much worried about how the whole project could backfire if handled carelessly: this is typically one of these time capsules you want to deal with carefully. How to revive the area without 'bukchonizing' it, without creating an artificial touristic hotspot and worse, a short-lived speculation heaven? At the center, covering Donhwamun-ro itself: Waryong-dong and Myo-dong (the former also includes large sections of the palace, and even a part of Jongmyo - otherwise mostly in the Hunjeong-dong sphere). To the west, towards Unhyeongung and Insa-dong: Unni-dong, Nagwon-dong, Donui-dong, and the already endangered Ikseon-dong. Where the gas stations used to be, an exhibition hall for traditional culture and a Gugak Arts Center will be constructed, creating a hanokish triangle with the gate. How to feed these cultural venues without depriving existing structures remains to be seen, but it's clearly a much more UNESCO-friendly scenery than the love motels behind. The 600 m stretch between Donhwamun and Cheonggyecheon will be "reconstructed", and I'm afraid this street could lose its vintage charm. This is a perfectly proportioned street lined with old trees, so please don't try to 'reconstruct' it. You wouldn't want to ruin everything the Jogyesa-way (its streetside now a sanitized disneyland), or even the Jeongdong-gil-way (see the "Jeongdong-kill" asphalt mess). 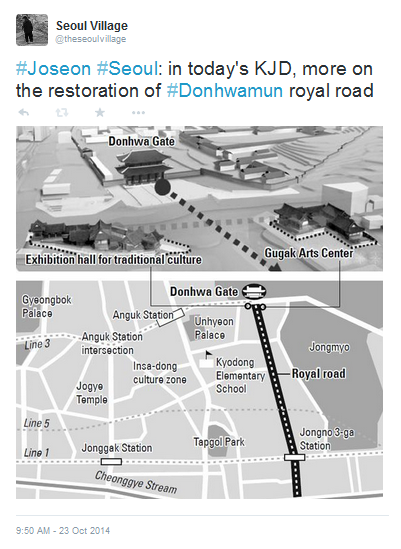 On the positive side, Donhwamun-ro could become pedestrian, like Yonsei-ro**. Seoul should remember that it put the restoration of its fortress on hold because the UNESCO didn't think that it hadn't been done properly until then... the priority here is to secure the area from speculative alterations. Bonus: it would be nice to avoid the usual touristic fakes. I'm shivering just thinking about yet another embarrassing costumed reenactment. You know, after the changing of the guards at Deoksugung or Gyeongbokgung, something like 'watch the King perform his royal walk along the royal road'? 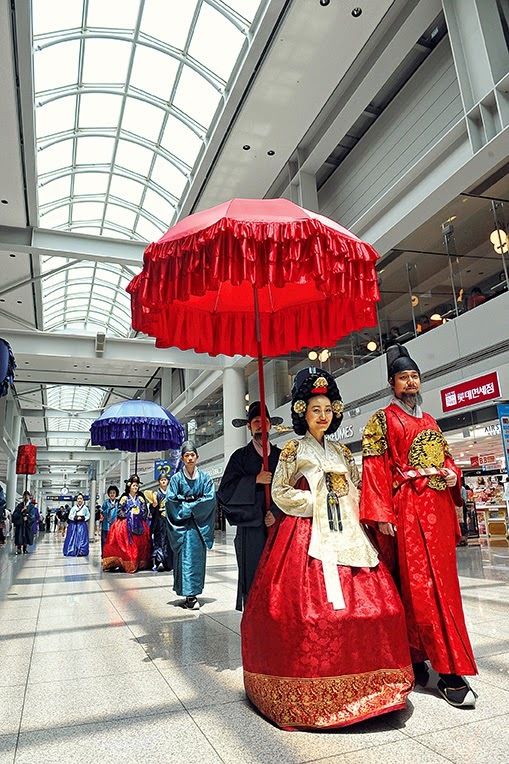 That's okay if you want to entertain duty-free shoppers on Incheon Airport's Airstar Avenue, but don't you think Changdeokgung and Jongmyo deserve something better? 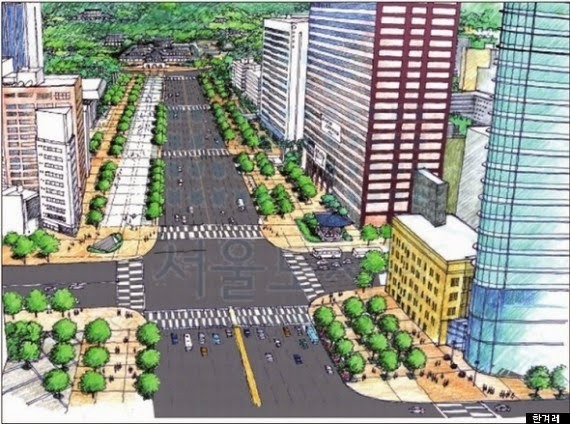 ** see "Yonsei-ro the first street in Seoul to ban cars in its transportation mix"
I added an illustration of the future Gwanghwamun Plaza, which clearly shows the return to a central highway.